I made you a big bowl of goodness. The summer is blowing by so quickly that this past weekend, I sat down and made a list of things (read: I typed in Notes on my phone) I want to do that are summery, every single day. Just so that when September gets here, I’m not all “wah wah wah we didn’t do anything summery this summer until vacation.” And I’m not talking about a true bucket list. I’m talking about everyday summer things. Like – eat outside more often. Drink more watermelon juice. Make mojitos once a week with your overflowing mint. Walk every day, sometimes twice a day. Swim with Max once or twice a week. And most importantly, why haven’t you had a sprinkle cone yet and for god’s sakes get one today and once a week from here on out. Nostalgia is creeping in on me already for the 4th of July because last year of the 4th of July, we shot our pregnancy announcement with sparklers and I’m all HOW WAS THAT EVEN ONE YEAR AGO. And when I say “shot,” I really mean that after everyone else had consumed a ton of beer and sangria, I forced them to hold sparklers about 17 times as they got very used to me saying NO NOT LIKE THAT DO OVER. I was going back and forth between sharing potato or pasta salad today and, well, potatoes won out. But! I took some inspiration from a few weeks ago when I made a bacon blue pasta salad for my mom’s birthday and kinda sorta turned it into potatoes. Almost the same thing. With soft boiled eggs because yolks are everything. Sooo I can be on the fence with potato salad. I don’t love the mayo-based versions, even though I’m making my own mayo now. They don’t do anything for me. (Though, um, I’ve been losing it over this one for a week now.) 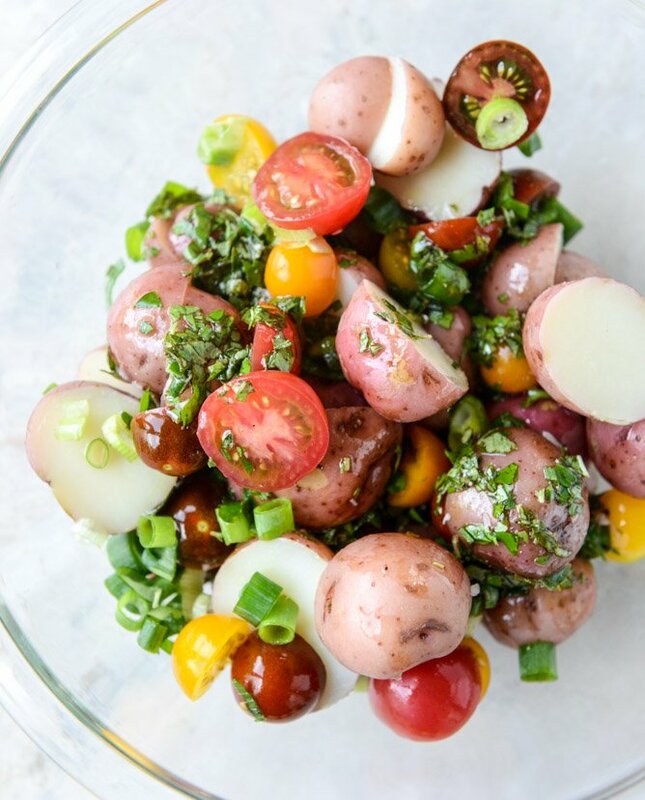 However, I love potatoes when they are tossed in butter or tangy herbs or something chimichurri-like and that’s where the inspiration came from for this vinaigrette. It’s really just olive oil and red wine vinegar and allllll the herbs from my garden. But that’s not even the best part! 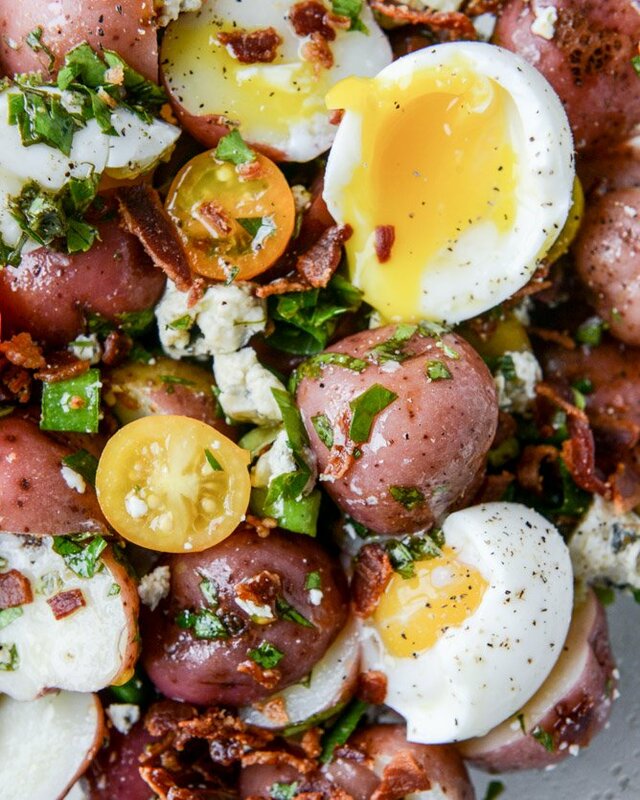 For once, I made a potato salad where I love every.single.thing that is tossed in it. Like really love. Like I mean there is nothing left in the bowl, no red onion slid slyly to the side and no globs of dressing pooled in the bottom of the bowl. and all the good feels of summer. Oh oh oh. 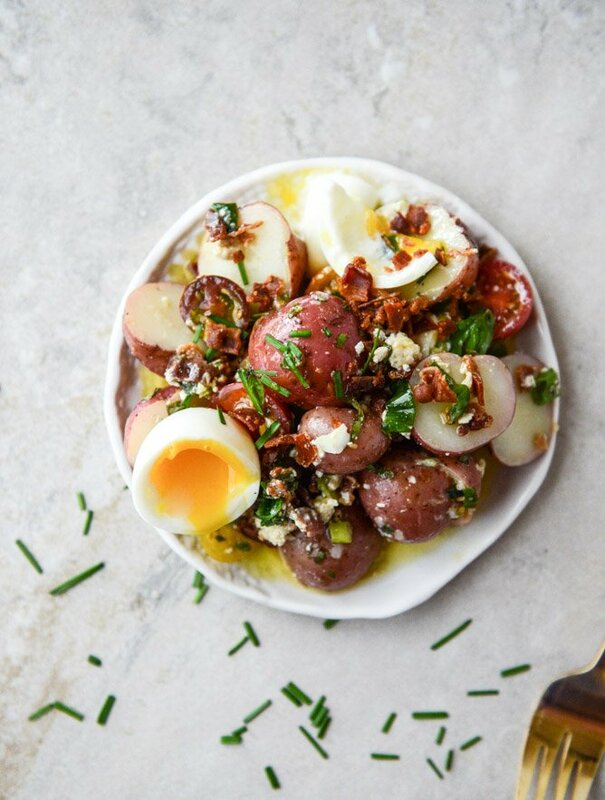 And if you really want to serve this on the 4th of July (because, duh), you don’t NEED to do the soft boiled eggs. I like to look at this as a two-part potato salad. It’s fab with the soft boiled eggs, but only for a small picnic or dinner thing. You know? 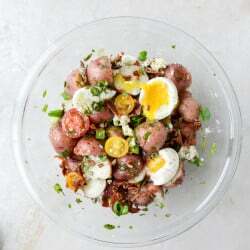 If you want to make it for a party this weekend where it may sit out for a bit, you can totally do hardboiled eggs or just leave ‘em out entirely. It’s still wonderful. ALSO! 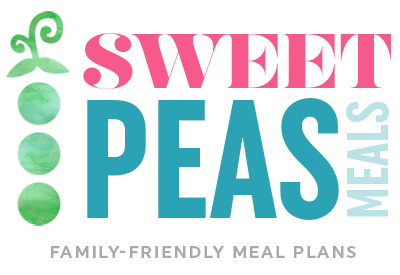 (It’s the last “also” I swear), this would be so, so perfect with sweet potatoes! Cubed or maybe even sliced into rounds?! Yes? Yes. Please come make that for my dinner. I’ll bring mojitos with all of my mint. Heat about 3 inches of water in a small saucepan pver medium heat until boiling. Once boiling, reduce the heat until it’s barely at a simmer, add the eggs gently and cook for 6 minutes. Remove the eggs with a slotted spoon and place in an ice bath. Let cool completely before peeling. Add the tomatoes and scallions to the potatoes. 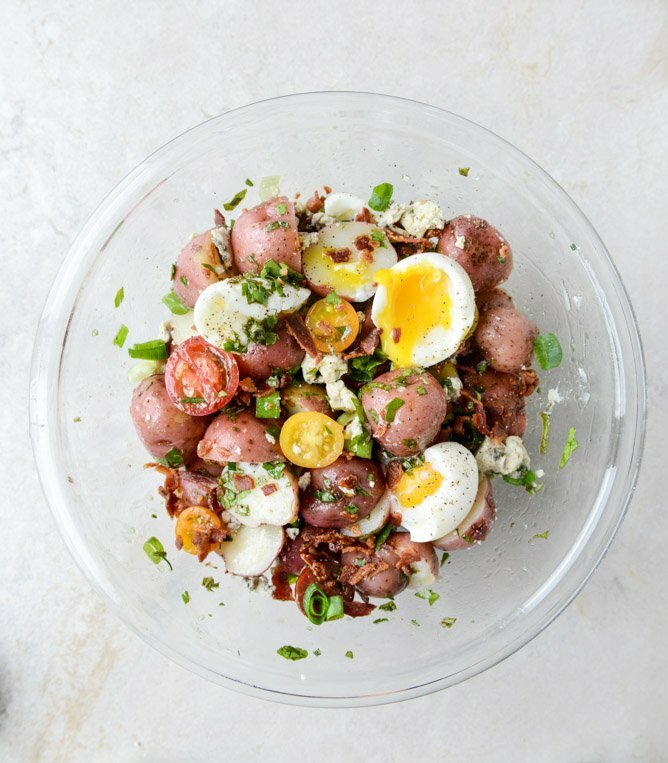 Toss the potatoes, tomatoes and scallions with a few tablespoons of the vinaigrette – enough to thoroughly coat the potatoes. Add the crumbled bacon in along with the blue cheese. You can add a little more vinaigrette here if desired. Top with the soft boiled eggs – whole or cut in half, however you wish to serve. Drizzle a bit more vinaigrette on top and add the chives (and any other herbs you’d like). Serve immediately. In a bowl, whisk together the vinegar, honey, herbs, salt, pepper and garlic. While whisking constantly, stream in the olive oil. Your vinaigrette is done! 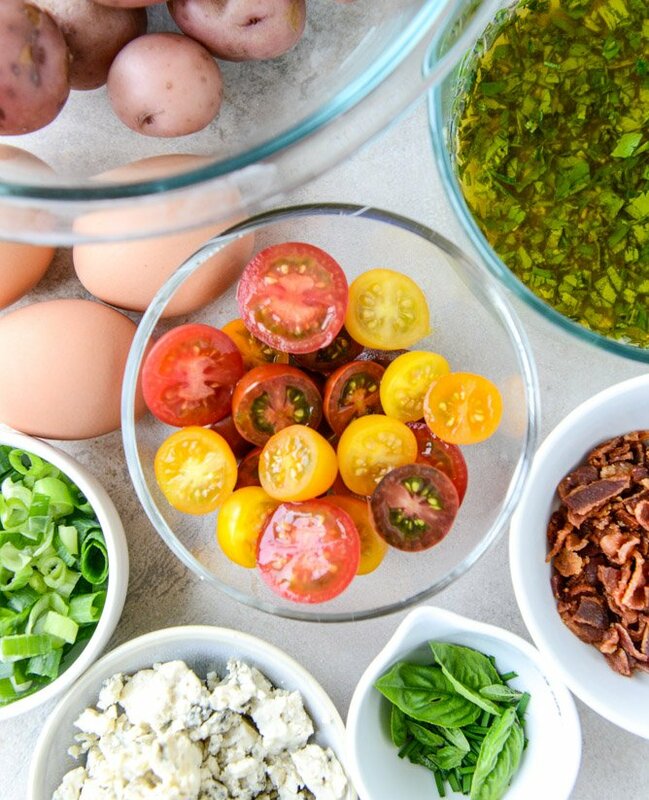 If you don’t use it all, it holds up in the fridge for a few days (just watch the fresh herbs). It’s an egg swimming pool. I made this salad over the weekend and it is FANTASTIC! Our batch yielded probably more like 6 servings, which was awesome. I will be making this again soon, for sure. The salad looks tasty and I’ll be making it son. One thing is in the title it appears that it is “blue potato” salad.